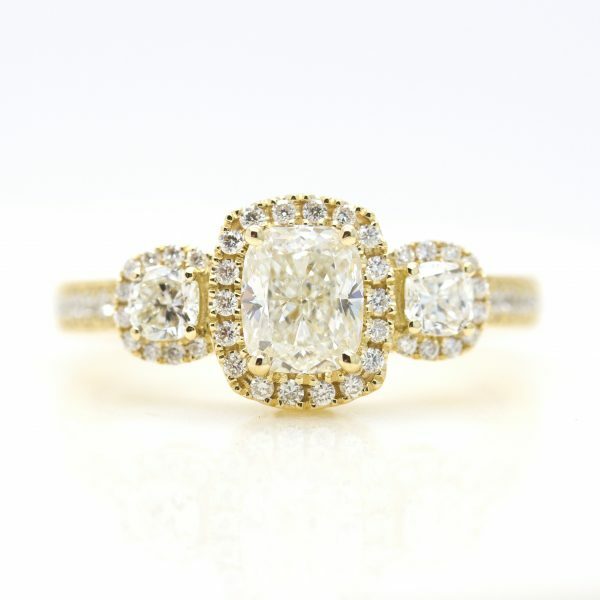 A halo engagement ring, designed and crafted especially for you. 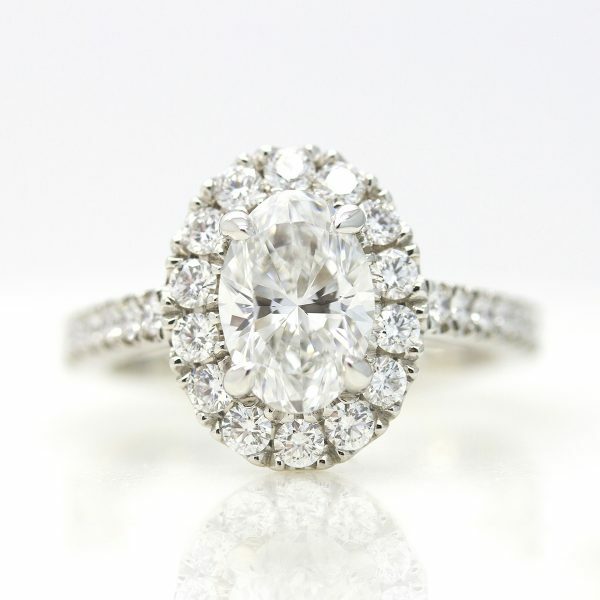 The halo engagement ring style delivers a striking presence and brilliance. 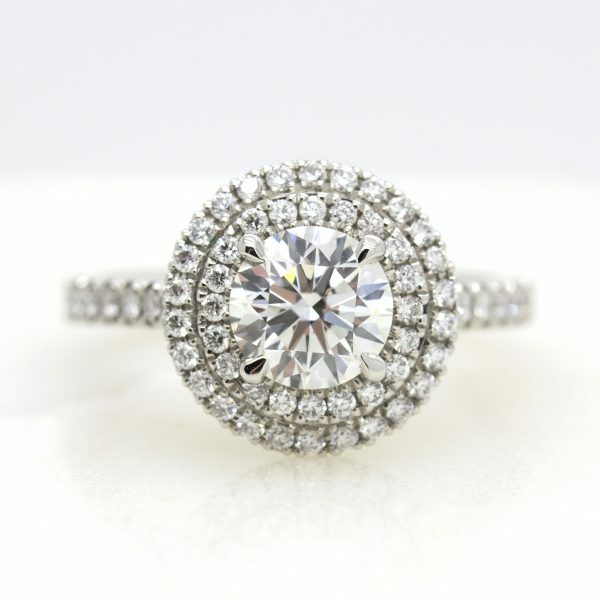 This ethereal style features a ring, or ‘halo’, of closely set smaller diamonds that surround the centre gemstone. 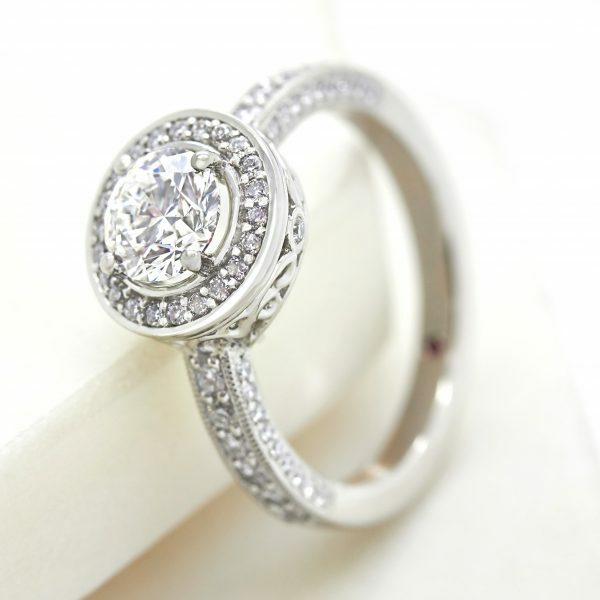 Halo engagement rings are an excellent way to enhance the overall appearance of your engagement ring as it cleverly makes your ring appear larger than it is, with a sparkly finish. 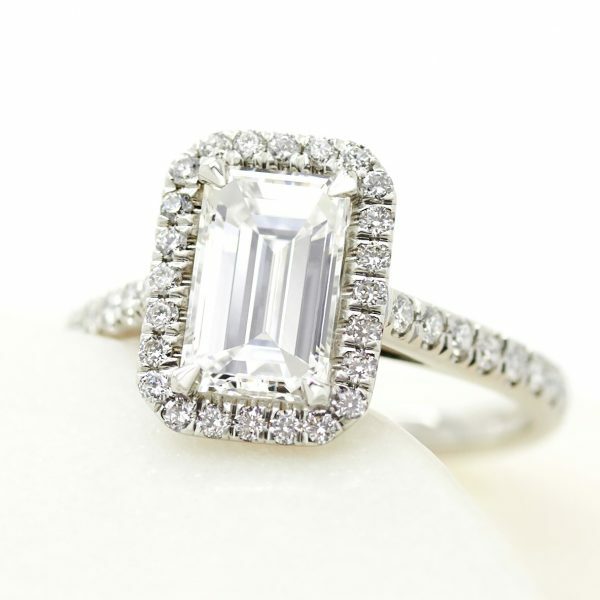 Halo engagement rings also often feature a pavé diamond or coloured gemstone shank which further enhances this style’s brilliance. 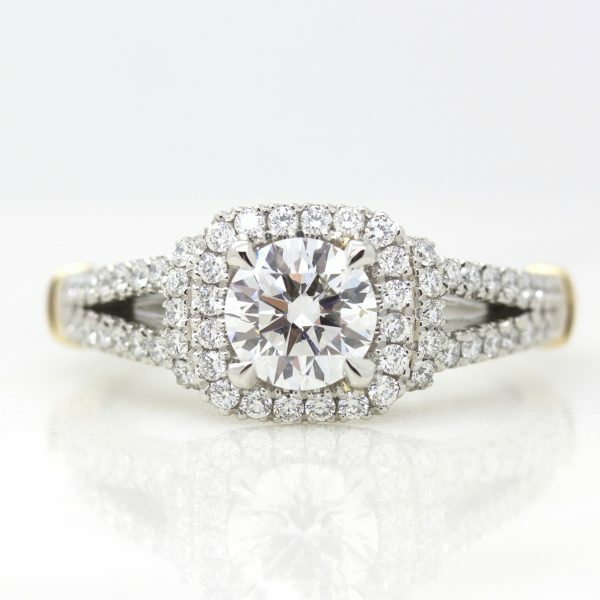 Its dramatic cluster looks exceptional with a combination of all gemstones and metals and is a great choice for an engagement ring that is sure to capture the attention of all who catch its glance. 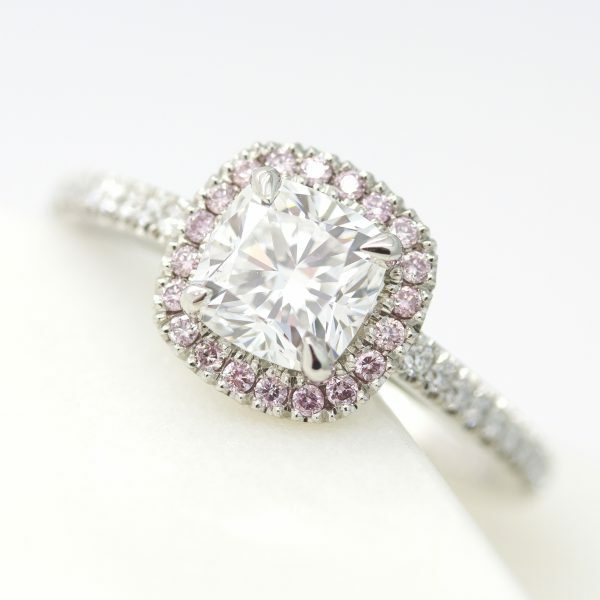 Be inspired by our halo engagement rings, individually designed with love by you and crafted by us. 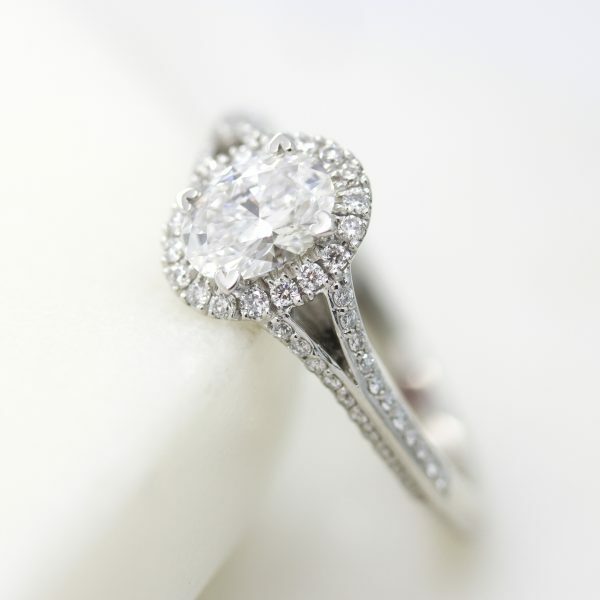 Why should I choose a halo engagement ring? 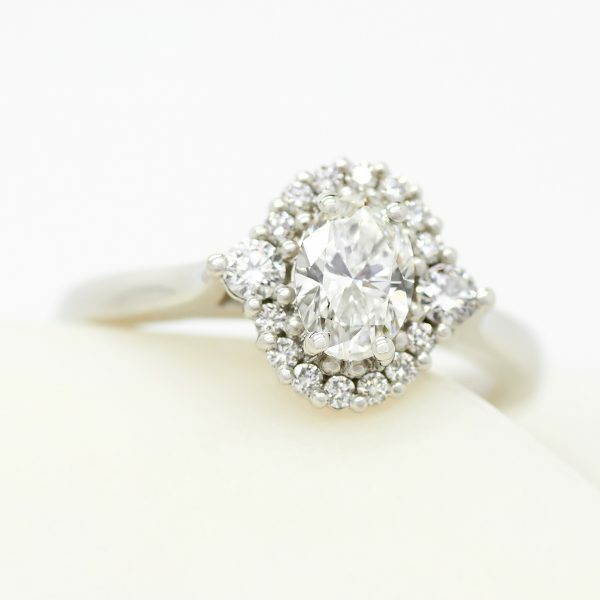 How can a halo engagement ring be customised? 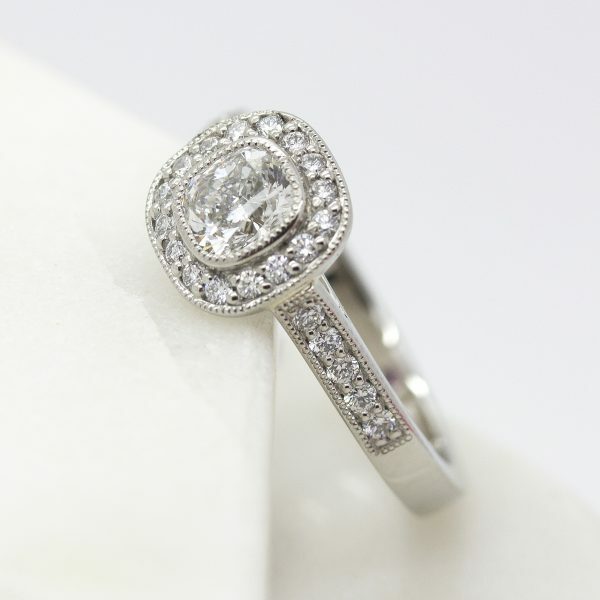 A halo engagement ring is a setting style that encircles a centre gemstone with a ‘halo’ or ring of closely set smaller stones. 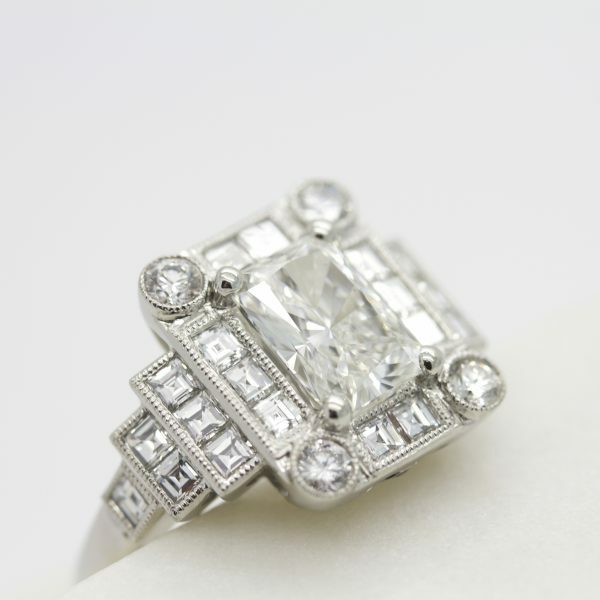 These smaller stones are often known as pavé diamonds or gemstones. 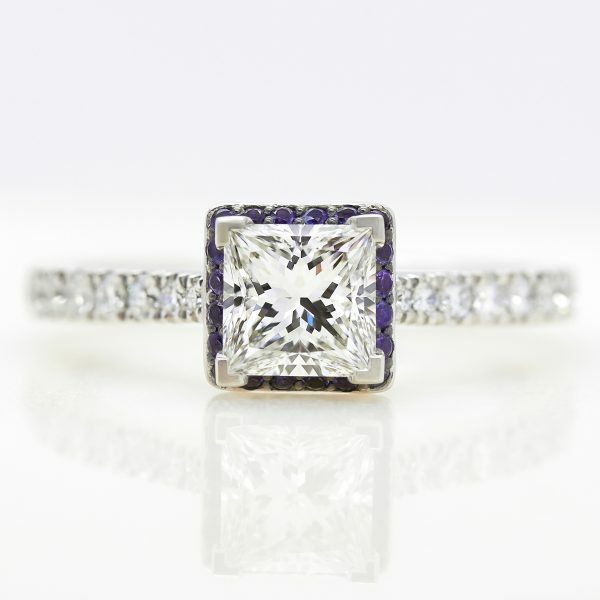 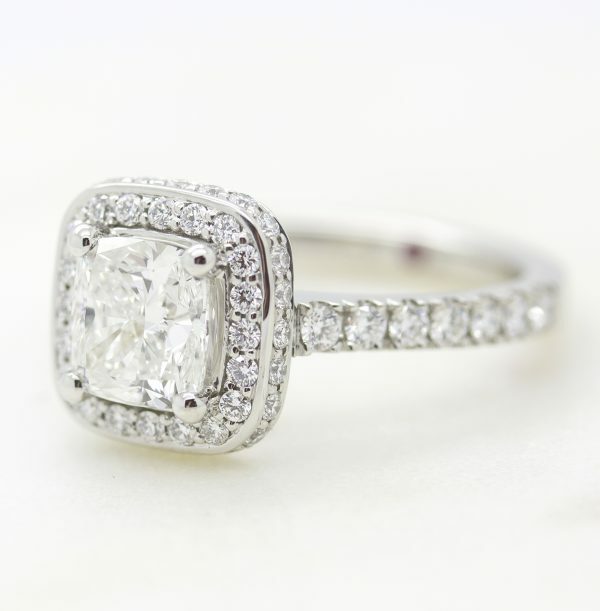 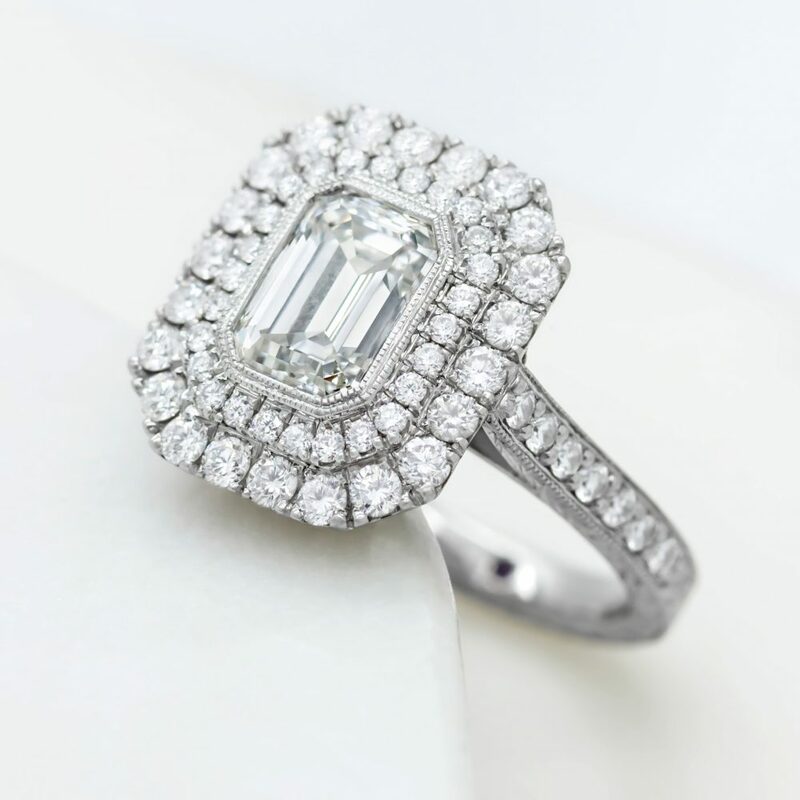 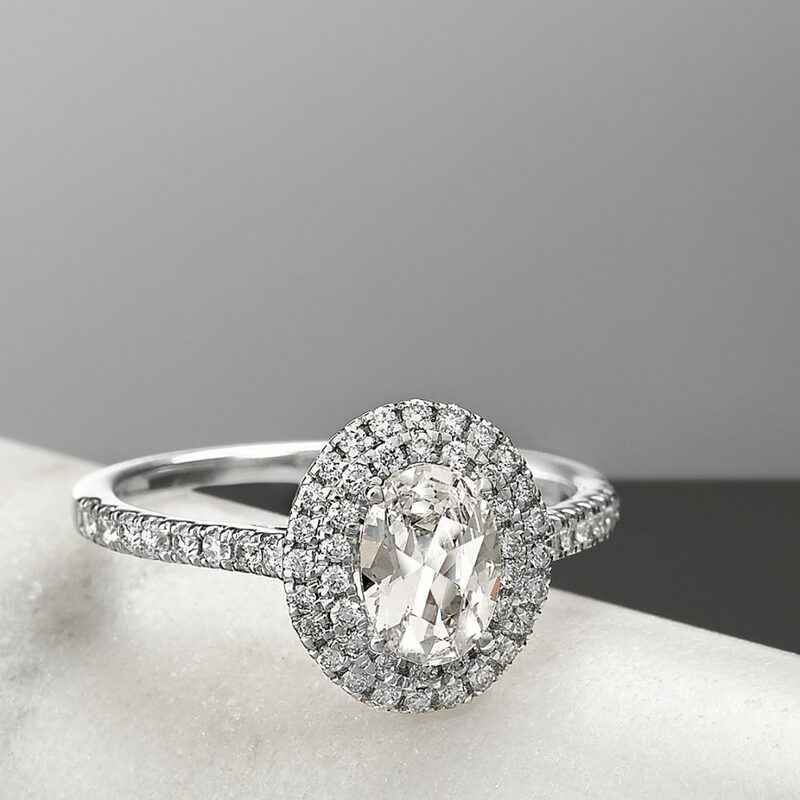 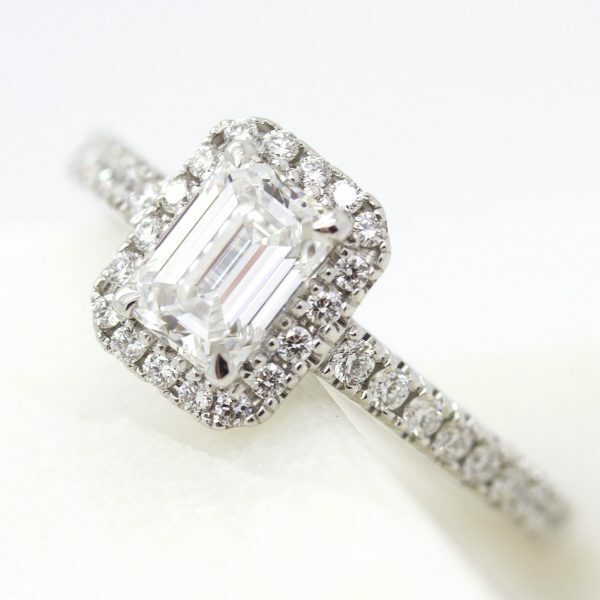 The halo engagement ring made its debut in the 1920s, at the height of the Art Deco era. 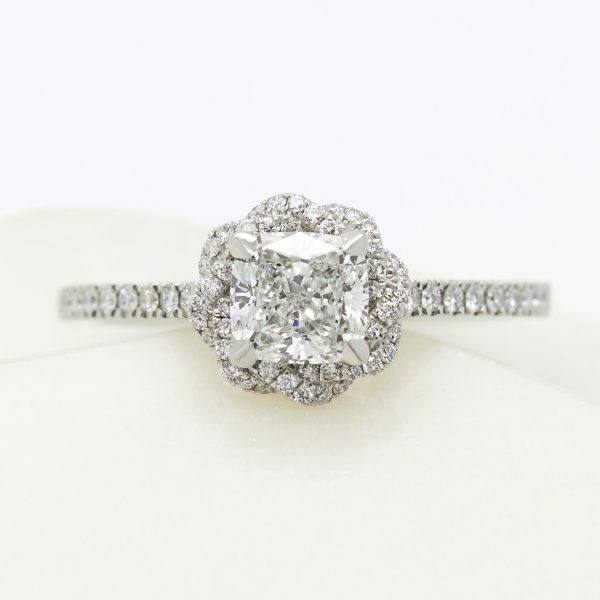 Today, the halo style has seen a resurgence, closely following the classic solitaire as the second most popular engagement ring style, for those who want an impactful twist on a traditional style. 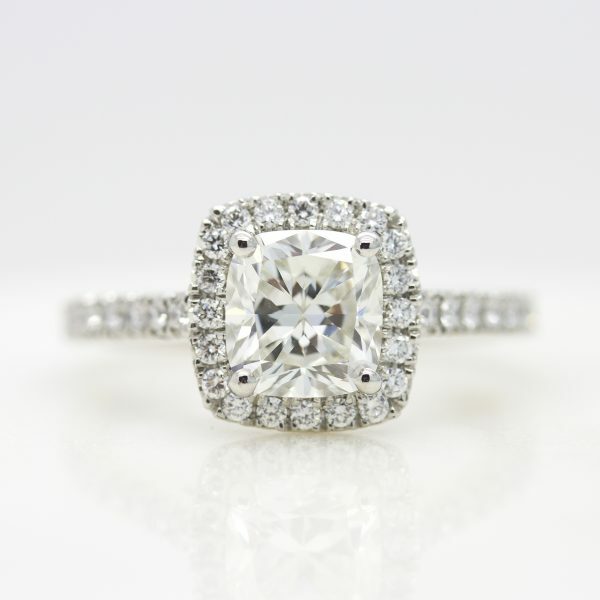 The halo engagement ring style cleverly enhances the overall appearance of your ring, as the surrounding halo gives the illusion that the centre stone is larger than it is. 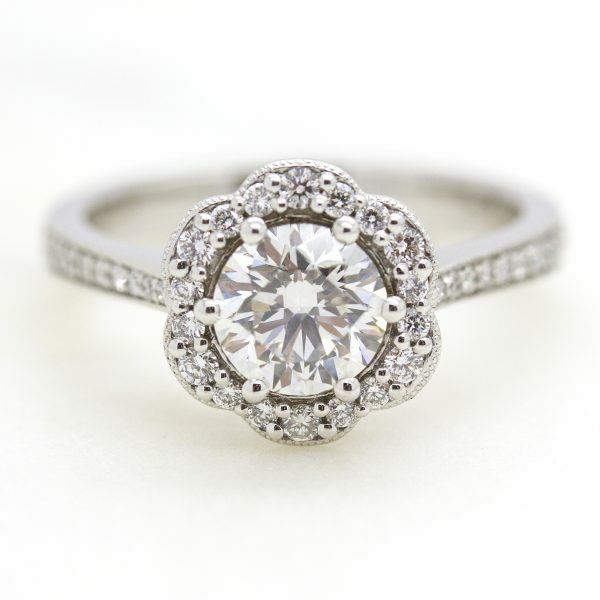 With its seamless, almost cluster-like effect, a halo engagement ring is perfect for those who want impact without the premium price point of a larger centre stone. 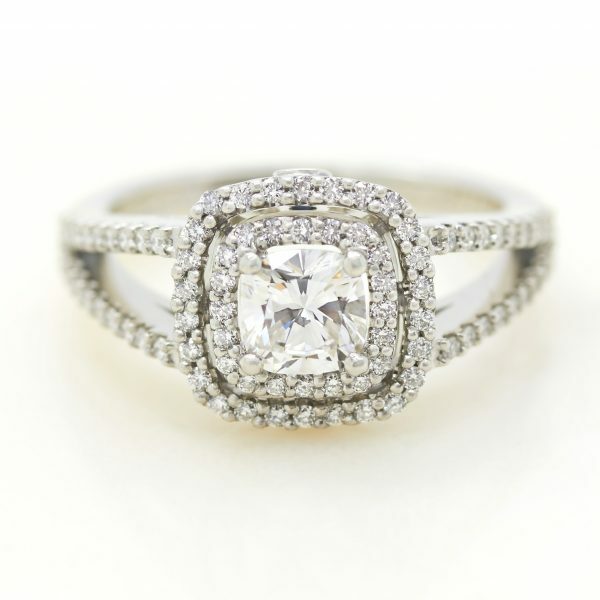 A halo engagement ring has countless combinations of customization. 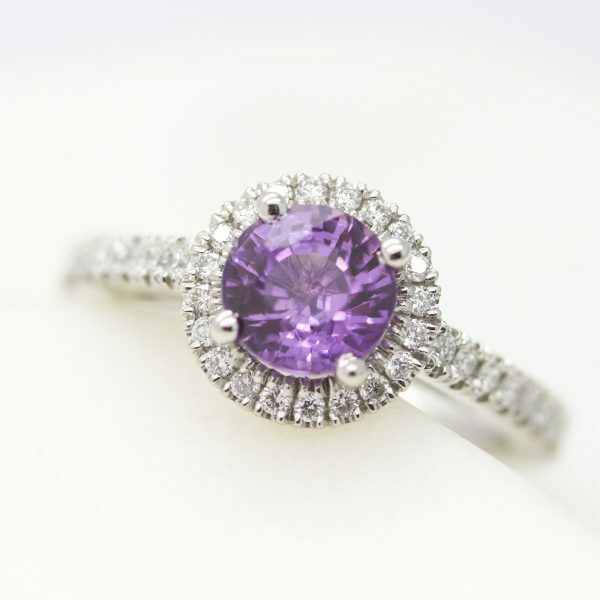 From different halo stone sizes, shapes and colours, a halo design can be entirely personalised without losing the traditional centre gemstone element. 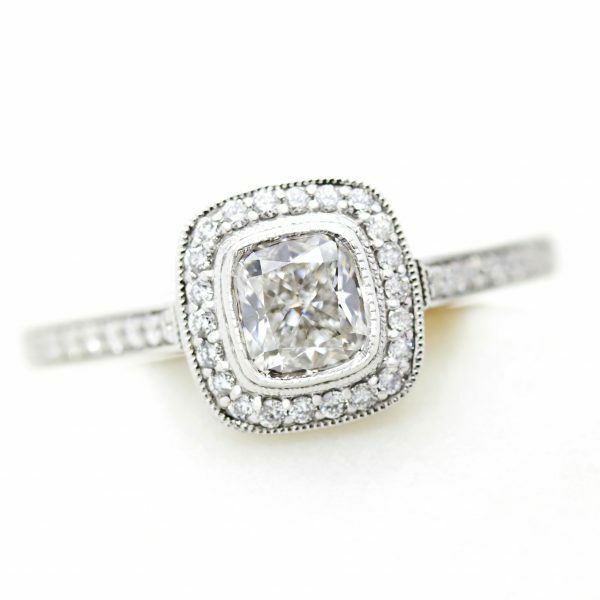 Halo engagement rings look beautiful with both a plain or pavé shank. 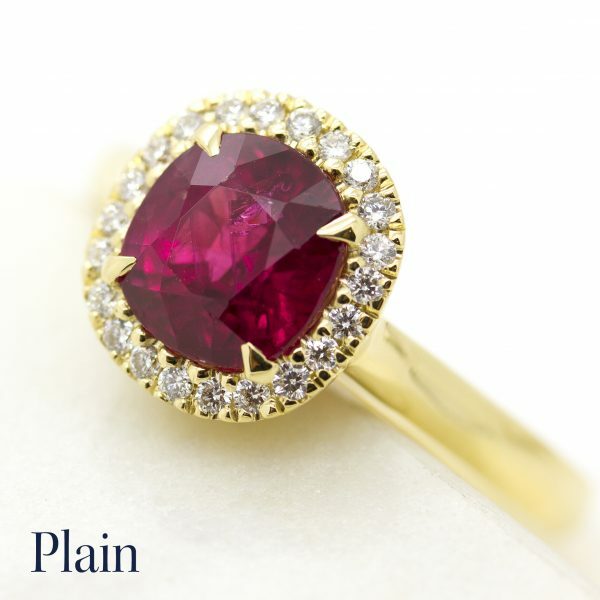 A plain shank offers a simpler, cleaner appearance and gives the centre stone a greater presence, while a pavé shank will result in a more brilliant overall appearance. 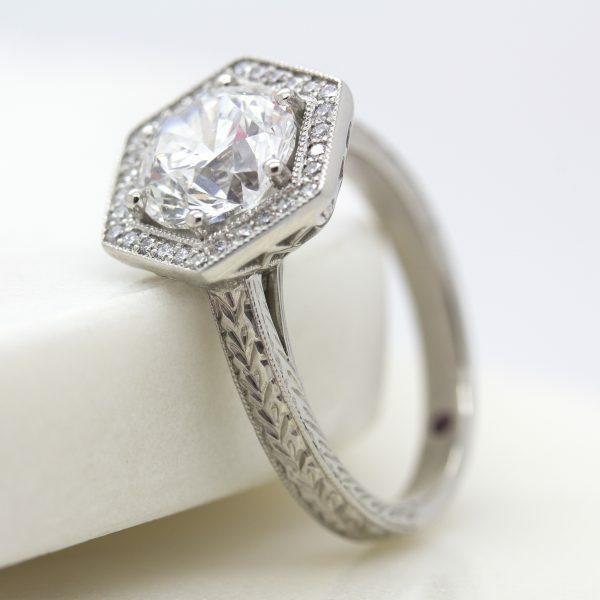 To follow the Art Deco style, the number of pavé stones on the shank is typically equal on both sides, creating symmetry. 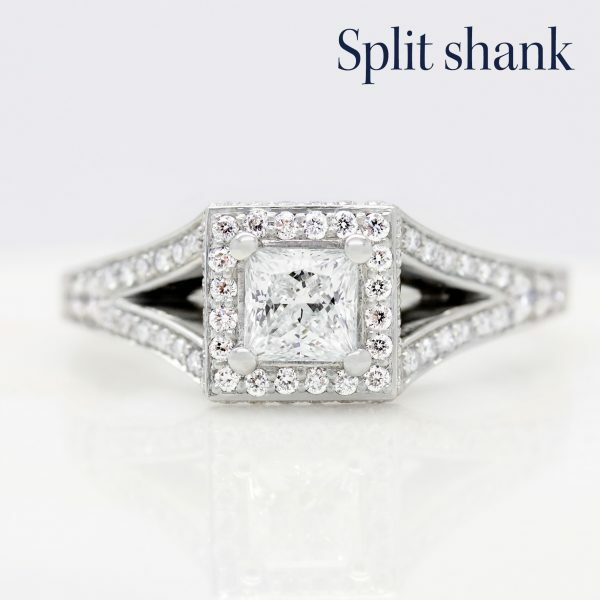 Alternatively, the shank of a halo engagement ring could feature a split shank, in which the band splits into two narrower bands. 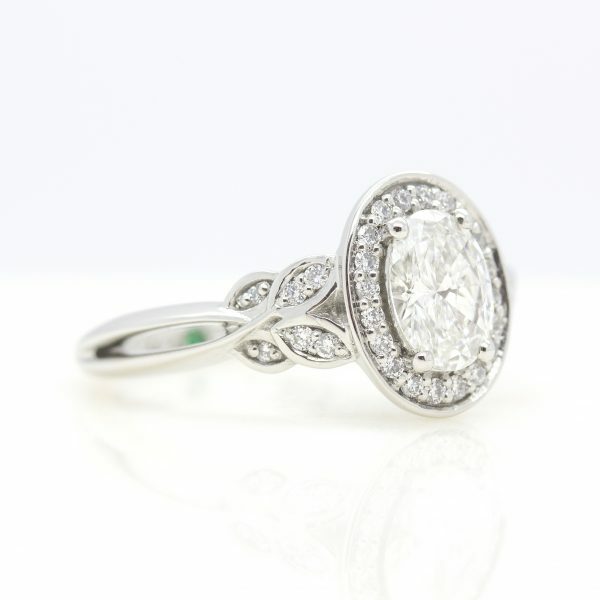 A split shank can be further customised by being entwined, twisted, pavéd or left in its originally polished state. 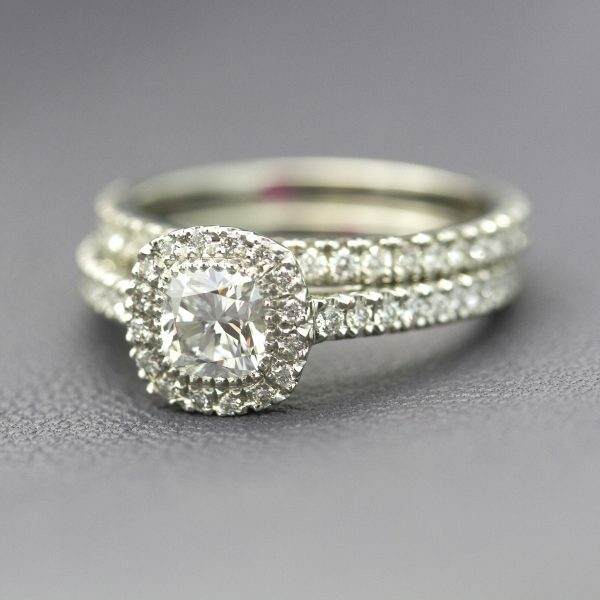 Any of these band finishes will give you the classic halo engagement ring style, with a different feel. 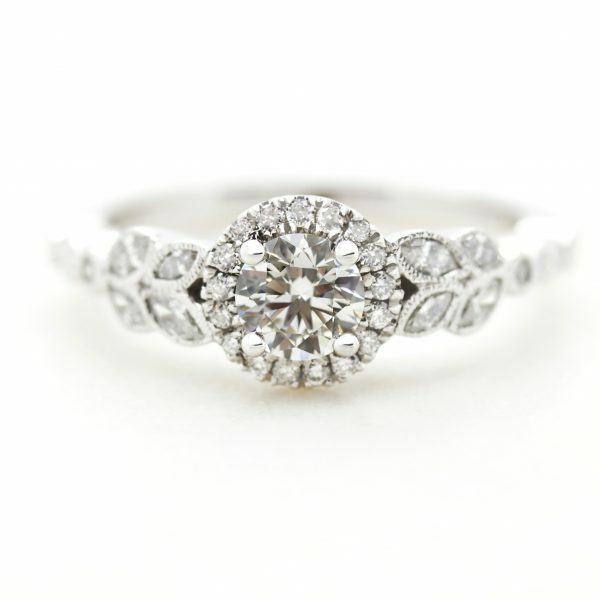 The centrepiece of a halo engagement ring can be a fancy-colour or colourless diamond, or another precious gemstone, such as ruby, emerald or sapphire. 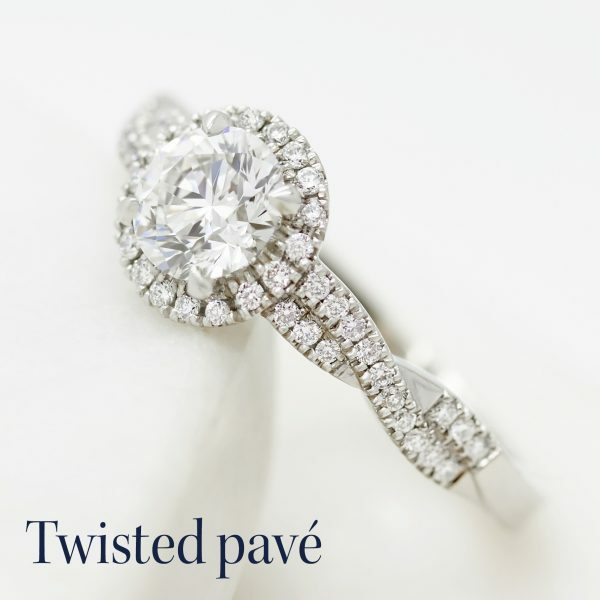 Each stone choice can be mixed and matched with other pavé choices for contrast, or can all remain the same stone type for a more classic finish. 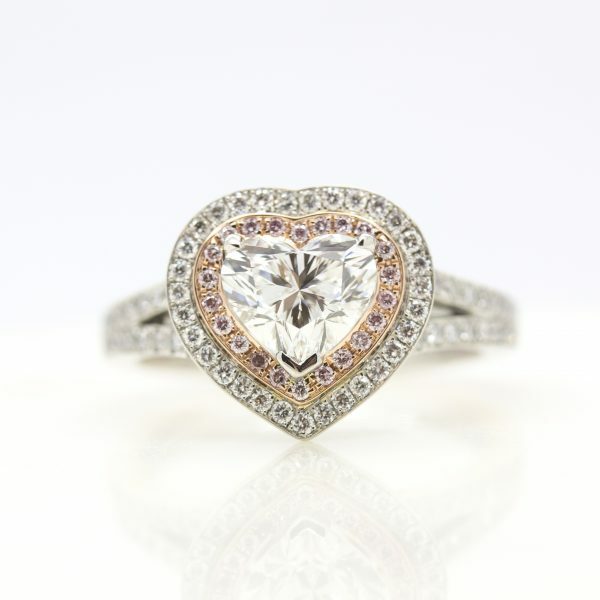 Round, cushion and princess shape diamonds and coloured gemstones are classic choices for a halo engagement ring style. 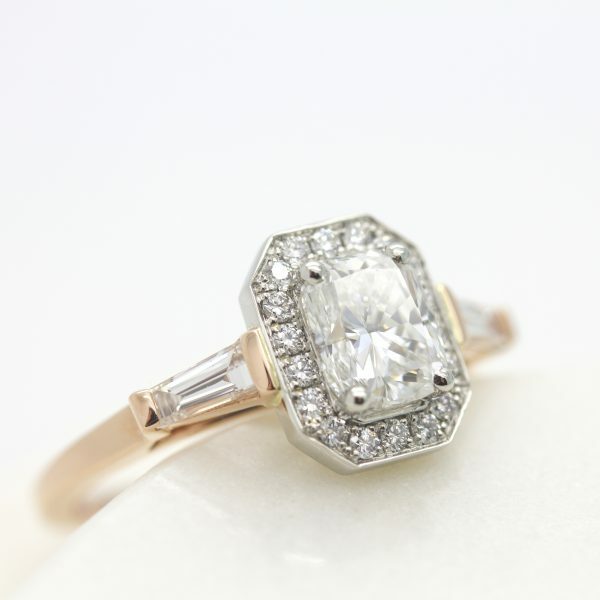 This doesn’t mean to say that other shapes don’t work. 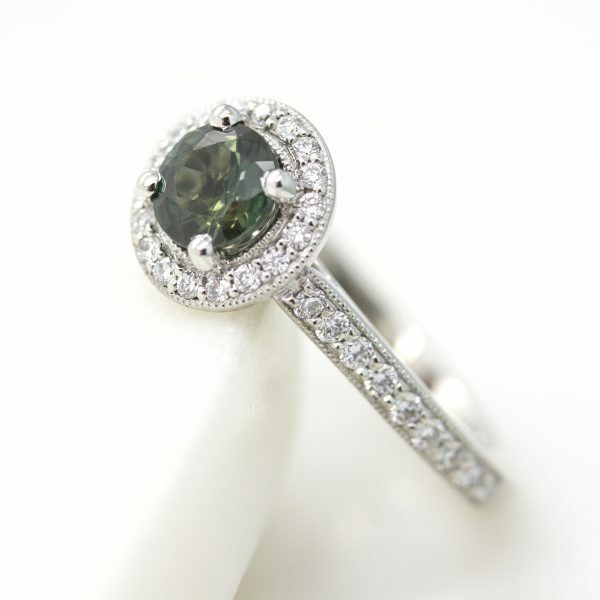 Ovals, radiants and emerald-cuts can look striking when wrapped in the stones of a ‘halo’. 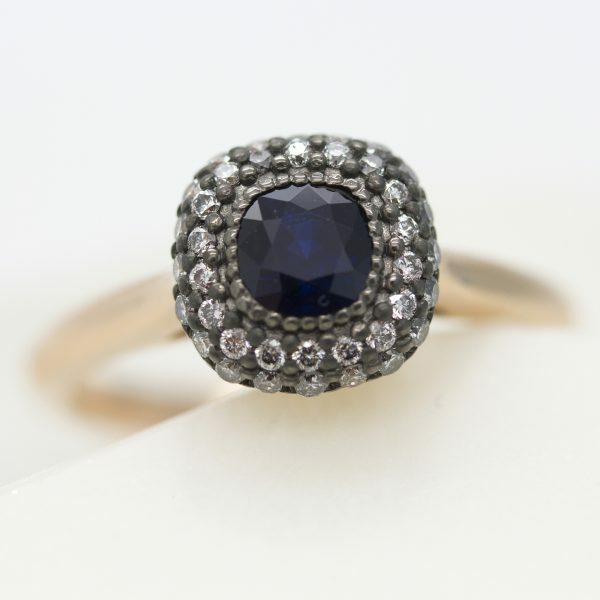 Even the pointed ends of cuts like the pear and marquise, that sometimes put people off, for fear of being caught or chipped, are actually softened and protected by the smaller stones that ‘wrap’ the centre stone. 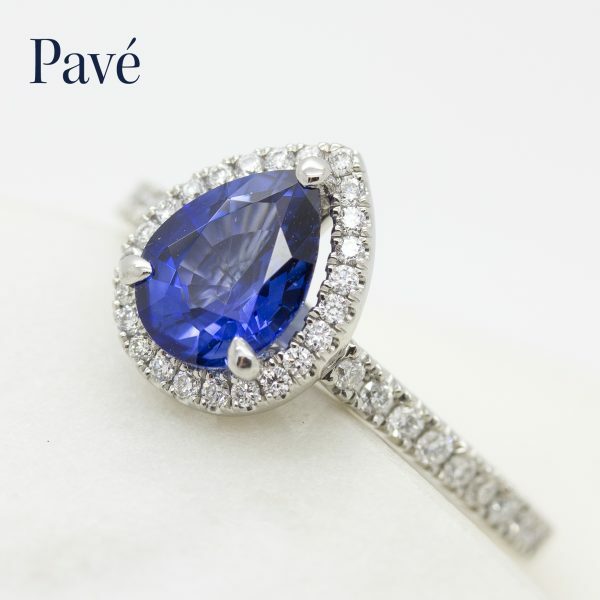 Choosing contrasting pavé gemstones gives your ring a custom look. 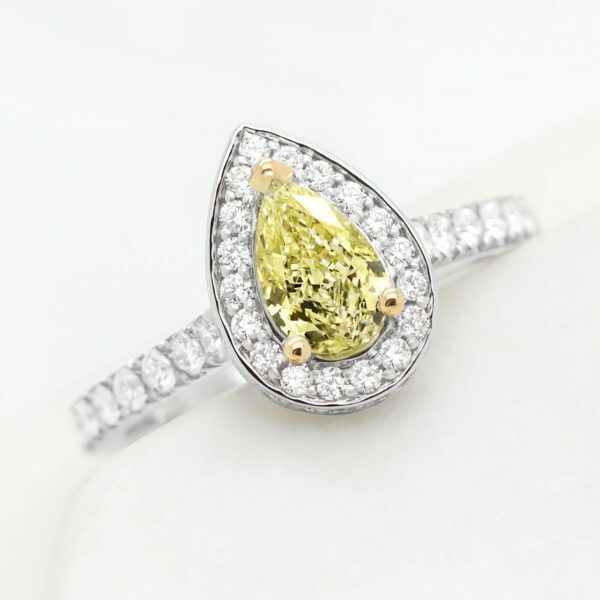 Colored precious gemstones as the pavé halo surrounding a colourless diamond combines tradition with a splash of bold colour. 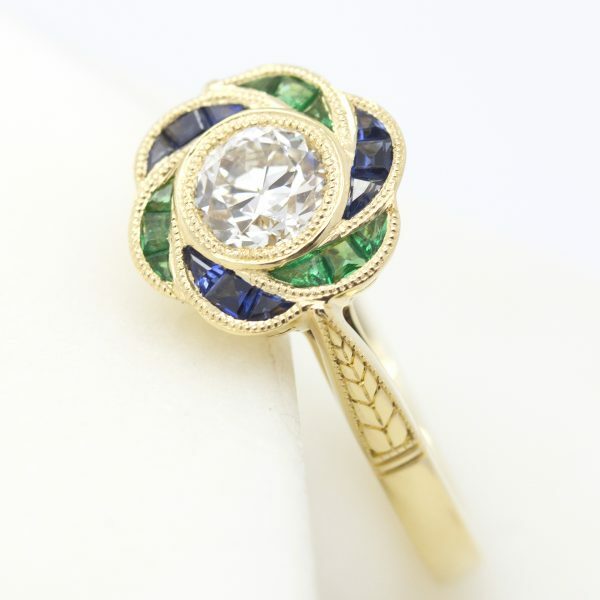 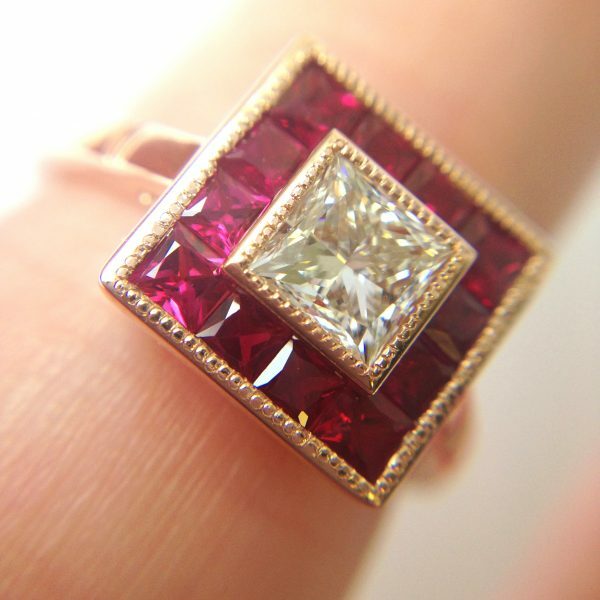 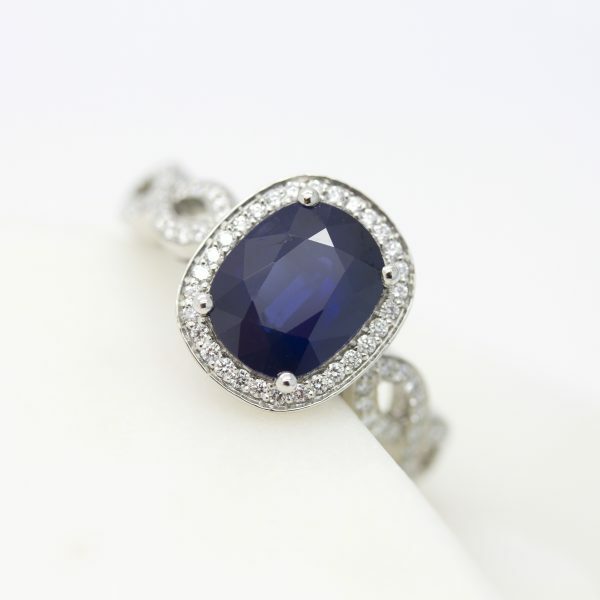 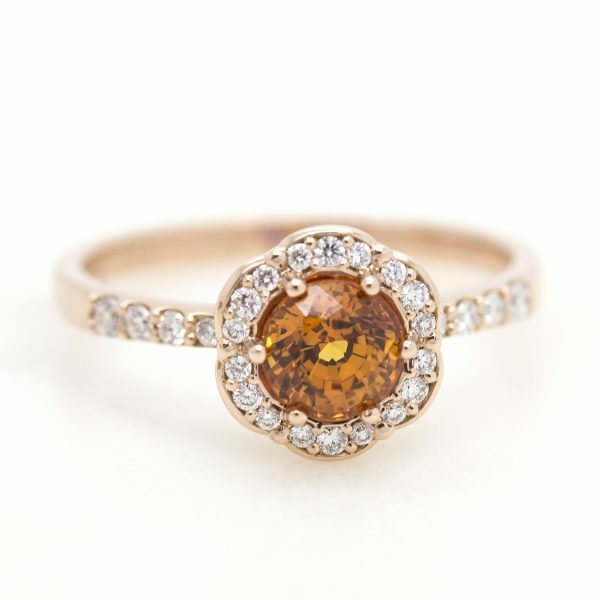 Or reverse it and use a coloured diamond or gemstone as a centre stone and surround it with classic colourless diamonds. 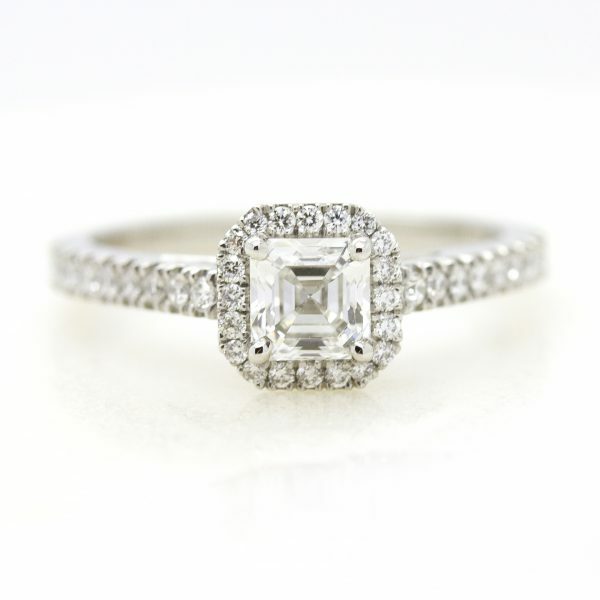 A classic diamond looks spectacular in the traditional metal choices for halo engagement rings, white gold and platinum. 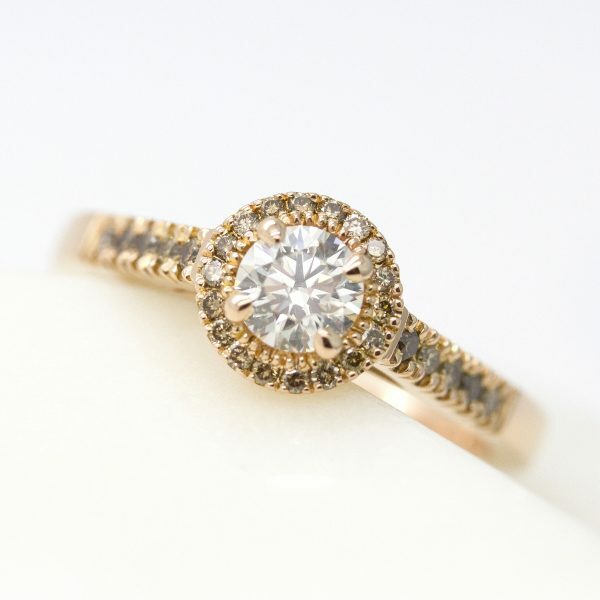 For diamonds with a colour grade of H or I, yellow and rose gold work to mask the slight tint that is sometimes present in lower colour grade diamonds, ensuring they remain looking bright and white in appearance. 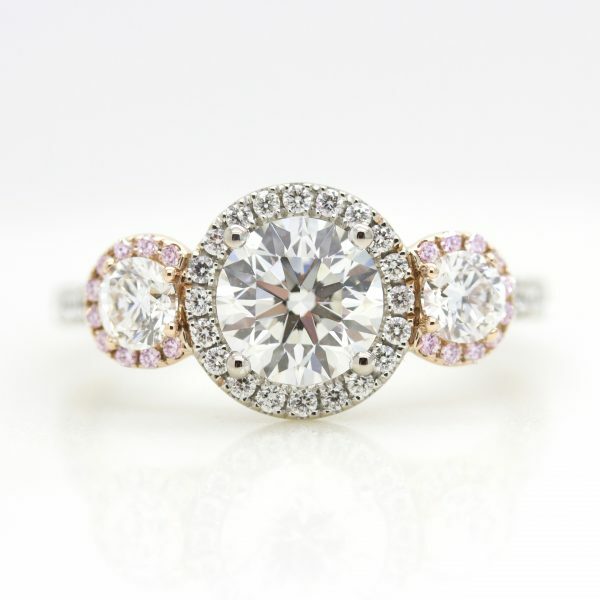 For this reason, mixed metal settings are emerging as an engagement ring trend that allows wearers to get the best of both worlds by using two tones without having to select D colour grade diamonds. 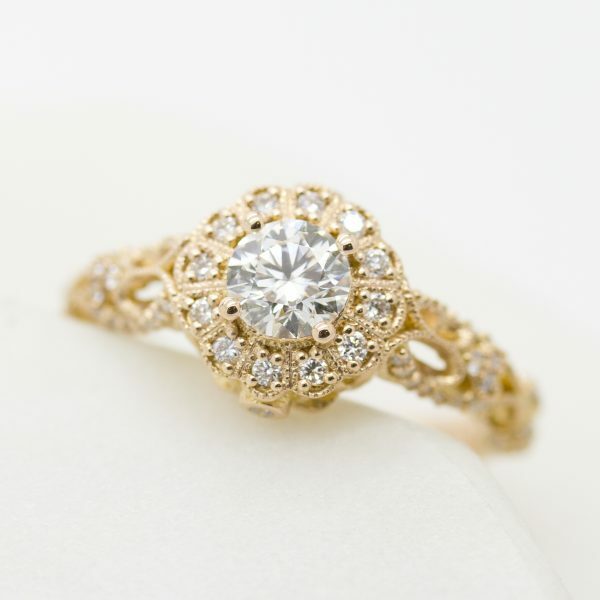 Rose and yellow gold have seen a rise in popularity in recent years not only due to their flattering appearance, but also the soft, warm tones they exude. 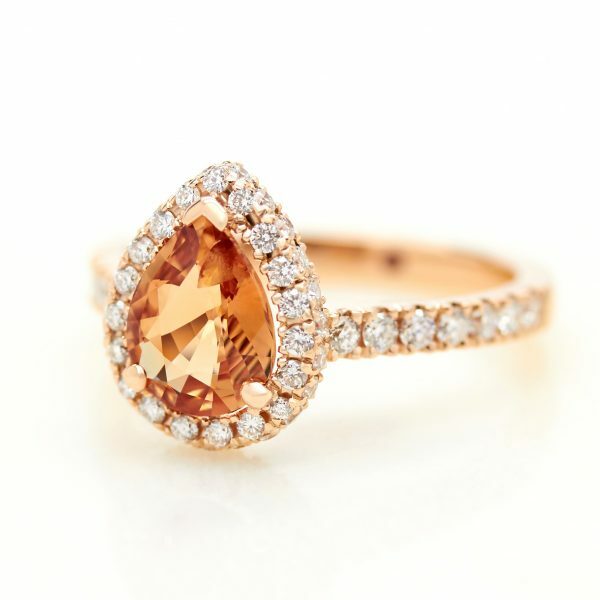 Their hue can also enhance the colour of assorted gemstones, so if you’re including coloured diamonds or gemstones in your halo, these metals will complement them perfectly. 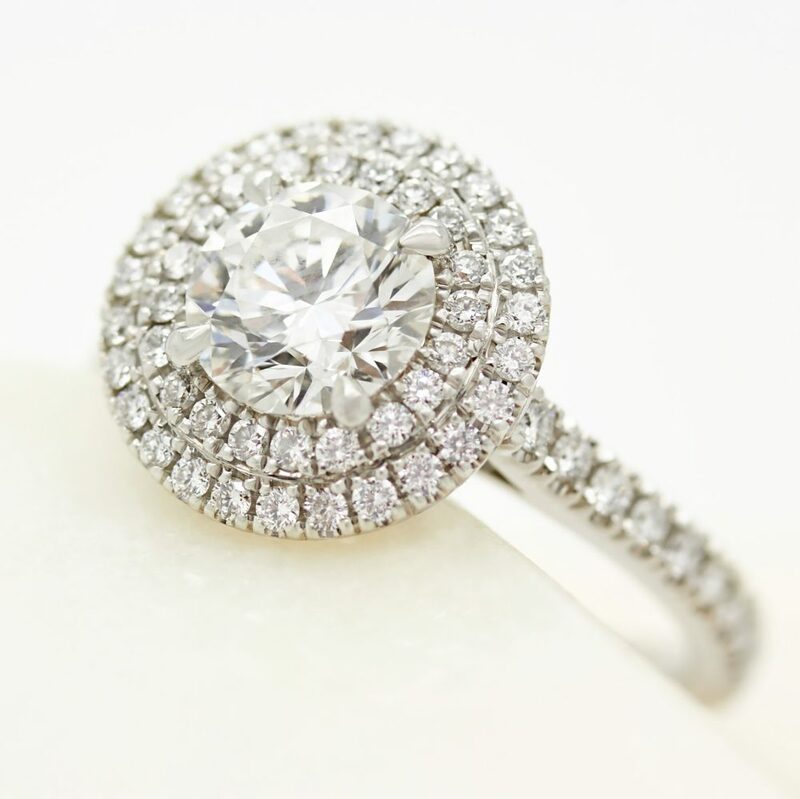 For those who yearn for a truly show-stopping piece, a double, or even a triple halo, circling your centre stone will give your ring substantial impact. 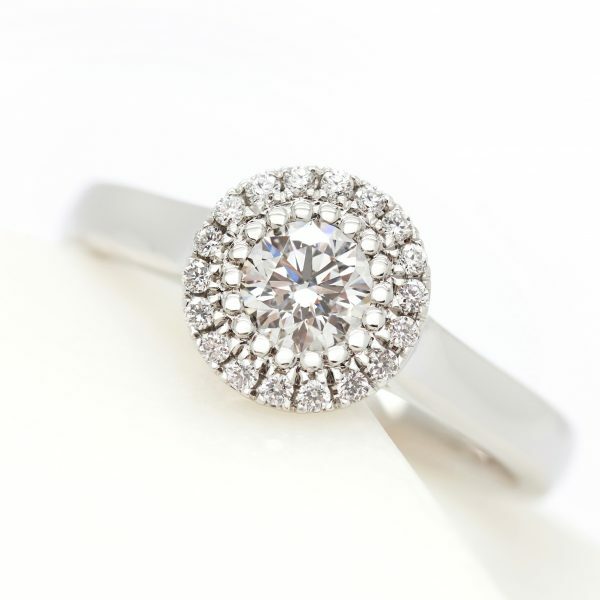 Each ‘halo’ of pavé diamonds or gemstones will make the ring look bigger, so a triple halo would enhance a very small centre stone without the premium price tag. 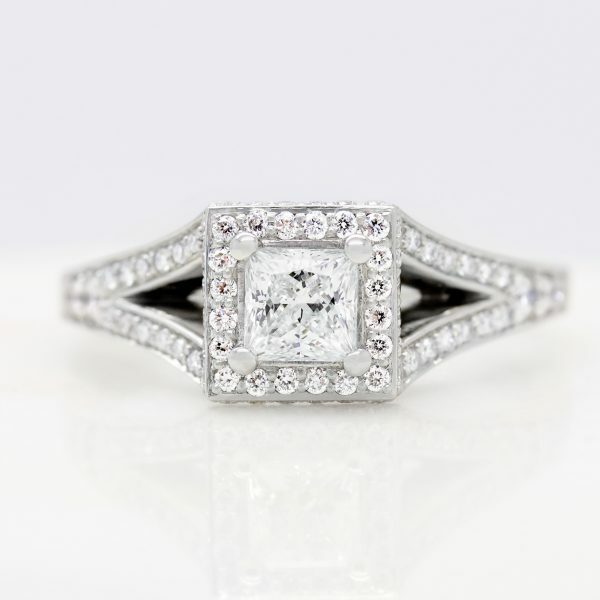 Sometimes a design requires a particular shape, size or colour that isn’t typically found in most classic halo engagement ring designs. 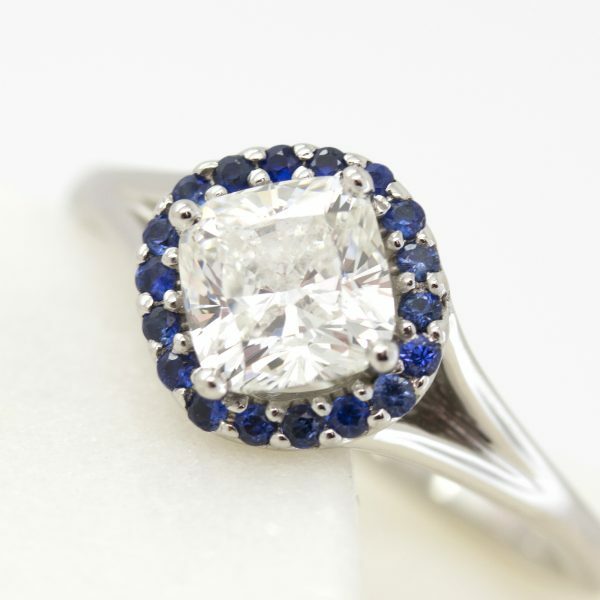 While custom cut stones come at a premium, they mean a design can be created exactly as envisioned, from scratch. 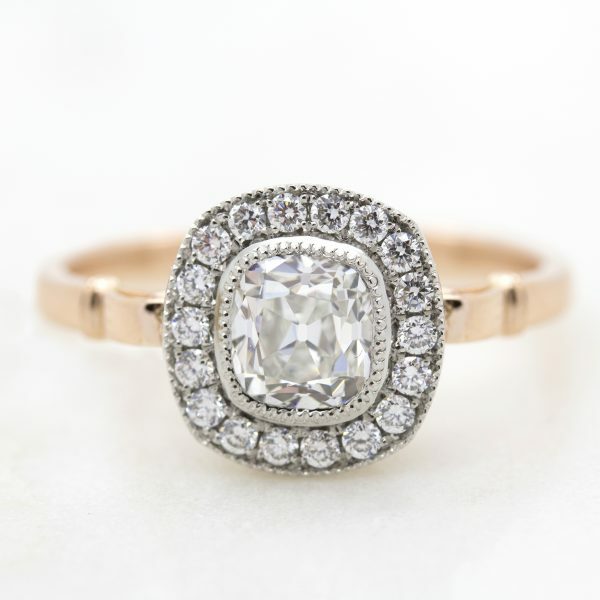 Which celebrities wear halo engagement rings? 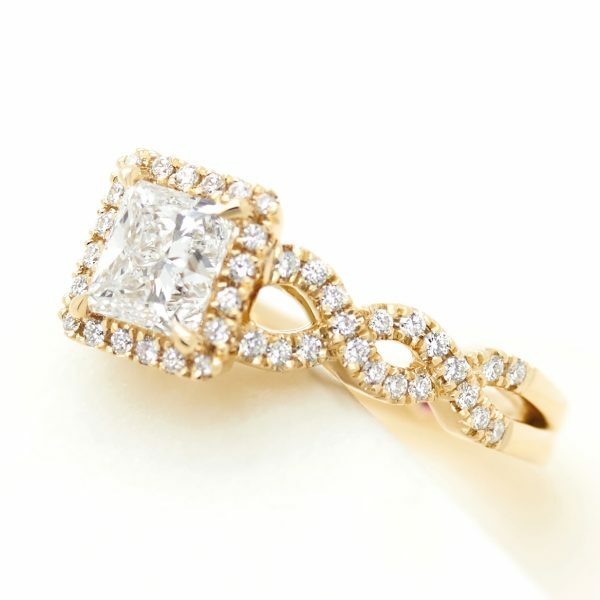 This style’s versatility is appreciated by hundreds of thousands of women worldwide, including some of the world’s most-recognised stars, from royalty to actresses. 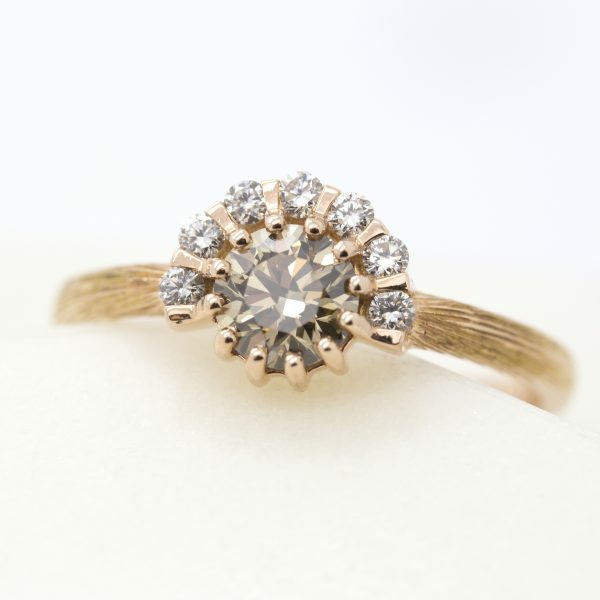 The Duchess of Cambridge’s, Kate Middleton’s halo engagement ring is a vintage Garrard design, once worn by her late mother-in-law, Princess Diana. 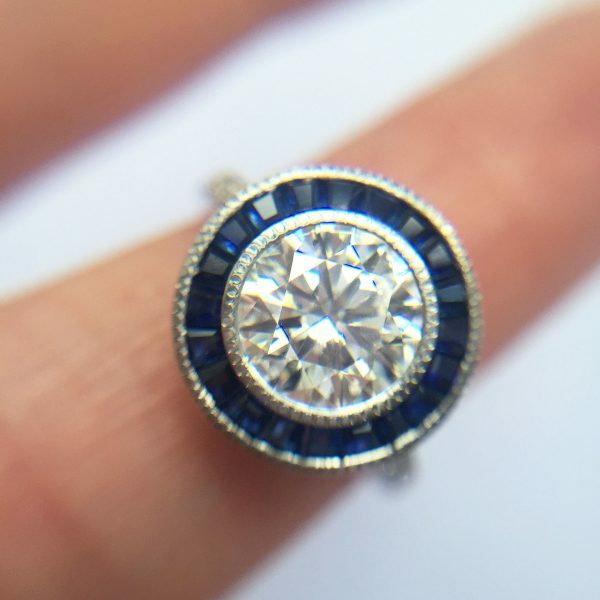 Featuring a blue sapphire surrounded by a halo of white diamonds, this ring design is perhaps one of the most iconic in modern day halo engagement ring trends. 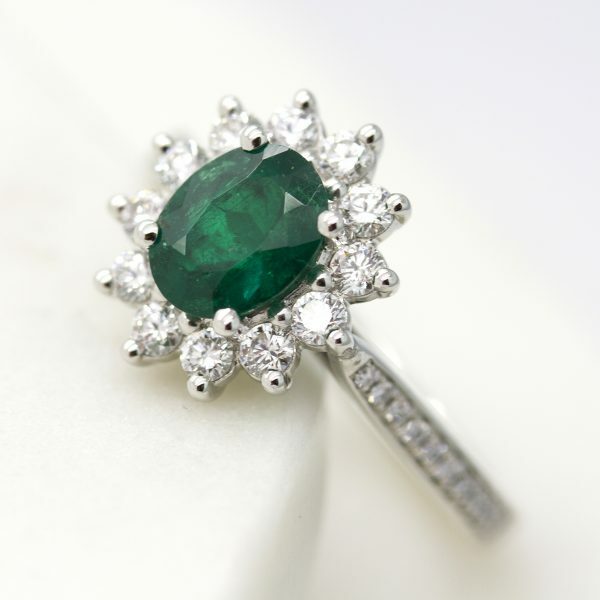 Other celebrities include, Kate Middleton’s sister, Pippa, Eva Longoria, Olivia Wilde, Sofia Vergara and Natalie Portman many of which include coloured gemstones. 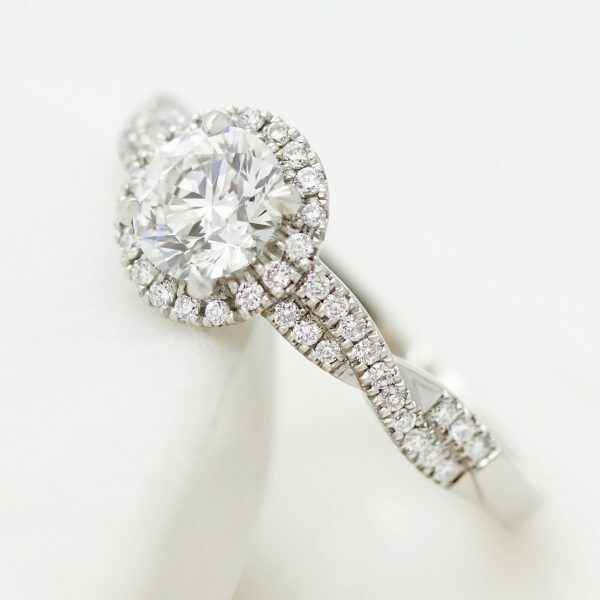 With a multitude of design customisations and details, the charming opportunities of a halo engagement ring design have not gone unnoticed and we presume their popularity will only continue.